Tip of the Week 31 » Stay on the Putting Arc – CHRISTINA RICCI MORE PARS! When it comes to putting, it is critical that we stay on the arc with a pendulum stroke. In this Tip of the Week, I share key points to help you stay on the arc and get more pars. So, let’s get to it! 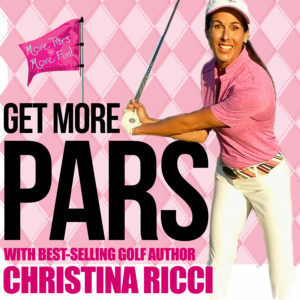 SUBSCRIBE to my YouTube/c/morepars Channel for lots more tips posted weekly! I'm on iTunes. Woo Hoo! My goal through these video podcasts is to motivate, inspire and share practical re-creatable how-to tips so you can reach your golfing goals this season. Subscribe to my Tip of the Week!